HARTNESS. HARTNESS married Pauline KUYKENDALL. Pauline KUYKENDALL [Parents]. Pauline married HARTNESS. Ronald MILLER. Ronald married Shirlene KUYKENDALL. Shirlene KUYKENDALL [Parents]. Shirlene married Ronald MILLER. HAMILTON. HAMILTON married Christine KUYKENDALL. Christine KUYKENDALL [Parents]. Christine married HAMILTON. Ernest KUYKENDALL [Parents]. Ernest married Amanda. Amanda. Amanda married Ernest KUYKENDALL. Jimmy L. KUYKENDALL [Parents]. Jimmy married Debbie. Debbie. Debbie married Jimmy L. KUYKENDALL. James TEAGUE was born in 1840 in , , Alabama. James married Jane KUYKENDALL. Jane KUYKENDALL [Parents] was born in 1840 in , , Arkansas. Jane married James TEAGUE. Fred KUYKENDALL [Parents] was born on 31 Mar 1870 in Grove Township, Shelby, Iowa. He died on 29 Nov 1928 in , , New Mexico. Fred married Gertrude NOEL on 16 Feb 1891 in , Bexer, Texas. Gertrude NOEL was born in Nov 1866 in , , Texas. She was christened on 24 Dec 1866 in Sacret Heart-Catholic, Medina, Bandera, Texas. Gertrude married Fred KUYKENDALL on 16 Feb 1891 in , Bexer, Texas. 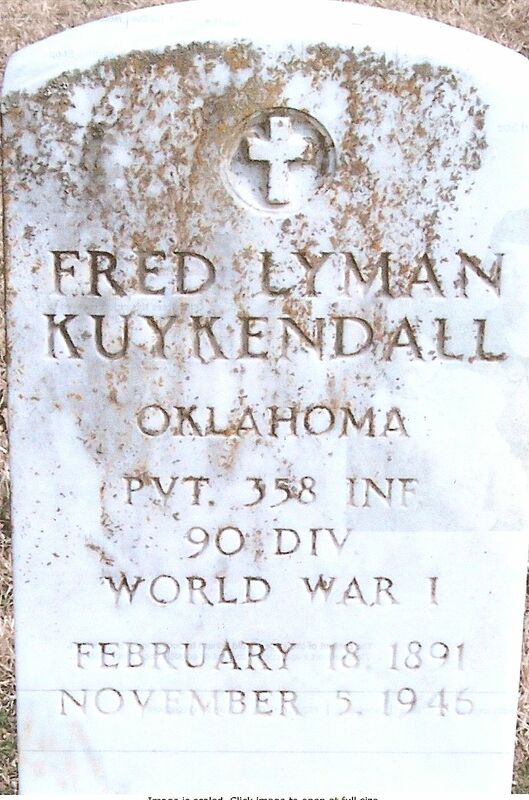 Fred Lyman KUYKENDALL was born on 18 Feb 1891 in , Bexar, Texas. He died on 5 Nov 1946 in Contra Costa, California. He was buried in Holdenville Cemetery, Holdenville, Hughes, Oklahoma. Ada Lea KUYKENDALL was born on 18 Apr 1892 in , Bexar, Texas. She died on 9 Jan 1950 in Los Angeles, Los Angeles, California. Josephine KUYKENDALL was born in Jan 1897 in , Bexar, Texas. Florence KUYKENDALL was born in Apr 1900 in , Bexar, Texas. Gussie KUYKENDALL was born on 27 Aug 1902 in , , Texas. She died on 14 Jan 1983 in Los Angeles, Los Angeles, California. M vi Alfred KUYKENDALL was born on 4 May 1904. He died on 14 Jun 1961. F vii Gertrude KUYKENDALL was born on 30 Nov 1906. She died on 5 Dec 1974. John REED. John married Elizabeth. Elizabeth. Elizabeth married John REED. Richmond KUYKENDALL [Parents] was born in 1832. Richmond married Elizabeth BATES in 1793 in , Garrard, Kentucky. Elizabeth BATES. Elizabeth married Richmond KUYKENDALL in 1793 in , Garrard, Kentucky. Judge Robert LINDSAY "Sr" was born in 1752 in , Orange, North Carolina. He died in 1801 in , Guilford, North Carolina. Robert married Esther or Elizabeth MEBANE. Esther or Elizabeth MEBANE was born about 1752. Esther married Judge Robert LINDSAY "Sr". M i John A. LINDSAY was born in 1767. He died in 1828. Elizabeth LINDSAY was born about 1769. She died about 1769.